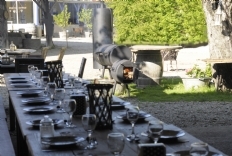 If you don't want to cook, you can join our table d'hôtes . Every night has a interpretation, so if you really want to keep holiday, you don't need to touch pan. Table d'hôtes sta nds for join the host and hostess. Don and Brigitte cooking a delicious meal several times a week. Brigitte is known for its delicious fresh soups and desserts to your finger licking good.If you smell something delicious on Ramonjavel you can be sure that Don has lit his great pride; his supersmoker, which we call Brutus because of his size. Guaranteed that you will enjoy a delicious, tender piece of meat or fish. Once a week you can enjoy a pizza buffet. Or you can eat French fries with chicken, just relaxing at your own tent. 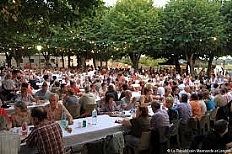 Don't miss the night markets where the Lot et Garonne is famous for. On Tuesday in Laparade and on Thursday in Fongrave. Typical French atmosphere.